When Windows 10 was launched, people were apprehensive about changing to the new operating system, the pretext being that many programs that were developed for previous versions of Windows are not compatible with the newer ones. While it is true that many programs are not directly compatible with the later versions of Windows, few know that Windows has an option called Compatibility Mode which helps users bypass this gap. However, setting the program to compatibility mode is not the only modification needed to help run a program, and we would discuss such cases in this text. 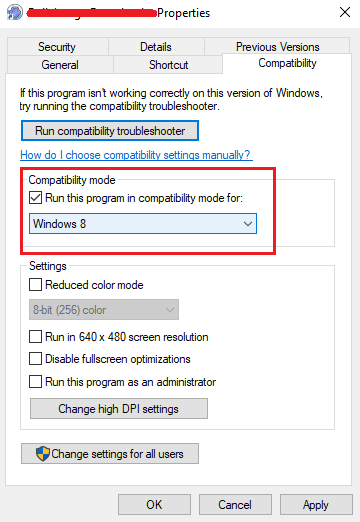 How to change the compatibility mode settings in Windows 10? 1] Right-click on the incompatible program and select Properties. Run this program in compatibility mode for: We could set the program in compatibility mode for the last known operating system it worked well with. Check the box “Run this program in compatibility mode for,” and select the operating system from the dropbox, which you wish to use for the compatibility settings. Reduced color mode: Older versions of Windows (especially Windows XP) did not have as many color settings as the newer versions, something which confuses the incompatible application. Run in 640 x 480 screen resolution: If you remember, older versions of Windows supported 640 x 480 screen resolution and most applications were set to the same ratio. This is where running a program in 640 x 480 mode would be helpful. Override high DPI scaling behavior: As mentioned in this reference, high DPI causes issues while running many programs. We could use this option to override the same, and interestingly, it is as helpful for newer applications, custom-made for Windows 10. Disable fullscreen optimizations: The OS allows graphics to adjust themselves in such a manner that they fit the full screen of Windows. However, it distorts applications which are not compatible with this provision, especially older applications. While the above mentioned options are good enough for helping run any program in compatibility mode, we never know where the fault is and which adjustment would work. Thus, Windows 10 has an inbuilt Program Compatibility Troubleshooter. 1] Search for “Run Program made for previous versions of Windows.” Open the option that pops up. 2] In the Program Compatibility Troubleshooter window, select the troublesome program from the dropdown menu and run the troubleshooter. It would ask for a few more details, which are pretty understandable. 3] Once done, restart the system.